I threw out something of a teaser last week when I referred to the Corte Sant’Alda Soave as “one of a couple Italian whites” I wanted to write up. Then I got a bit busy, plus May is Aussie Wine Month here so I feel like a traitor to the state even contemplating this. But then there’s this Verdicchio. I only had a brief flirtation with it at a tasting in March and now it’s like a homeless puppy you accidentally grow too fond of. You know you’re hopelessly ill-equipped to take care of it but really, who could resist such playfulness? 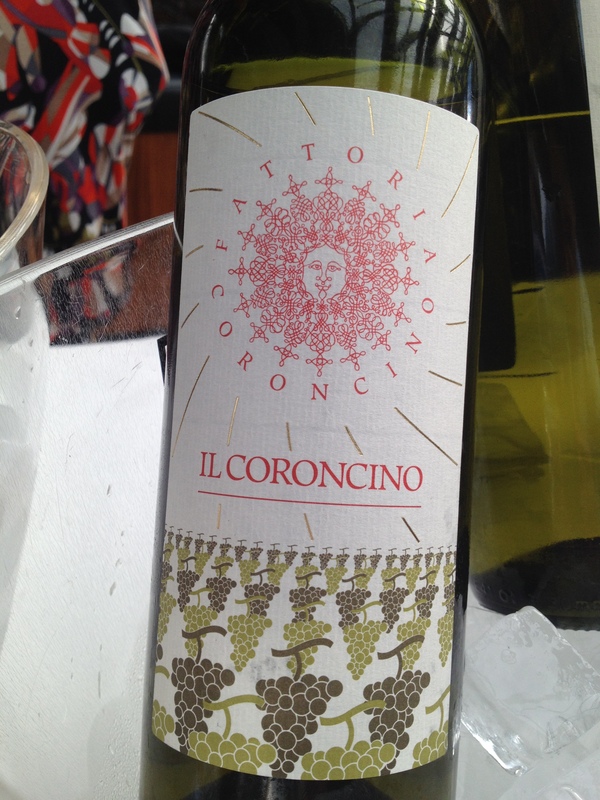 The wine in question comes from the organic and biodynamic (though not certified) producer Fattoria Coroncino. This is the second Verdicchio to feature on Bonnezeaux Gonzo, the first bring the rapturously received but stylistically different Umani Ronchi. Both exhibit typical almond and brine but where the Umani Ronchi was subtle and slow to reveal itself, its counterpart is joyous and generous. 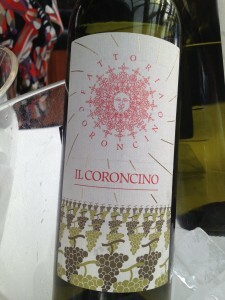 Fattoria Coroncino was founded in 1981 by Lucio Canestrari and his wife, Fiorella De Nardo. They live in Staffolo, about 35km southwest of Ancona in the Marche region of central Italy. Verdicchio is very much their bag; their stated aim is to prove that there’s much more to Marche’s signature white than mere pizza wine. Lucio and Fiorella make a Sangiovese/Syrah blend in small quantities, but otherwise it’s Verdicchio all the way. The pinnacle is Gaiospino, a single-vineyard wine aged for 18 months in 500-litre oak vats. At the opposite end of the scale is Il Bacco, which they endearingly call “a slave wine” because it’s always at your beck and call – any food, any mood, any time. 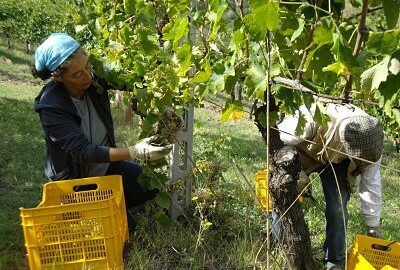 In the right vintage they’ll also put out a passito wine, made from Verdicchio grapes left to raisin on the vine. But back to my puppy: Il Coroncino. The fruit comes from a clay-based, north east-facing slope next to the cellar, with a view of the Adriatic. The grapes are picked by hand from the densely planted vineyard, then gently pressed and wild yeast fermented in stainless steel. The resulting wine has plenty of texture, body and acid, which means you’re laughing all the way to the dinner table. I’d like to see it again with spaghetti alle vongole or rabbit and pea risotto. But you could nudge it a fair bit further – coniglio in porchetta would be a whole heap of fun. Clear medium green gold in colour, it gives off an initial whiff that reminds me of toasted corn; not altogether inviting. Overall fairly muted on the nose, just grilled almonds and apple skin. A different story in the mouth: a juicy attack of pear and stone fruits that builds to a crescendo. That sweetness is offset by briny and bitter almond notes. The texture is waxy and unctuous, the body fullish. Fine, citrusy acidity appears to pull off the feat of balancing the richness and high alcohol. Heady orchard blossom perfume and a bitter twist linger on the long finish. Four European countries, five whites from seven different varieties, all with one thing in common: they’re made for summer. They’re not cheap but certainly cheerful and worth the asking price. I came across them in various different ways: the Verdicchio had a certain fame that prompted me to take it to a blind tasting; the Albariño and Grüner Veltliner were brought to my attention by sommelier, blogger and closet Italian Raffaele Mastrovincenzo; and the Saint-Mont blend and Timorasso caught my eye at a tasting with a couple of Melbourne importers. They are Ludovic Deloche, whose Halle Aux Vins brings in some lovely French stuff, and Naz Fazio of Vinositá, who weaves similar magic from Italian materials. I almost went off it when I read in fab new mag Noble Rot that this was pretty much the house white for Coldplay. I’m sure they’re nice guys, but if their music were wine, I wouldn’t even cook with it. Of course, they’re millionaire rockstars who can afford to bathe in this stuff, so what do they care? Bear with me, because that name needs some picking apart. Grüner Veltliner is the variety and it’s Austria’s signature white, with Wachau an exemplary region. The grapes were grown on steep terraces (‘Terrasen’) and ‘Federspiel’ is the ripeness/style classification. Where were we? Oh yes, wine. So it’s pale lemon in colour, with a nose of apple, pear, stone fruits, white pepper and musk. The dry, medium-bodied palate displays pear, ripe apple and dried apricots, with high acid and a marked minerality, finishing long with almond oil and stone fruits. A very good, expressive wine, which should develop nicely over the next few years. A blend of Gros Manseng, Petit Courbu and Arrufiac from a recently upgraded appellation in southwest France. The name means ‘rediscovered vines’, and Arrufiac in particular is something of an endangered species. From the foot of the French Pyrenees, it gives a slight herbal/citrus bitterness to the finish. This wine has a pronounced nose of white flowers, white peach, fresh apricot, tangerine, grapefruit, white pepper and fresh mint. Fresh fruit spills forth on the palate, with fresh apricots, pear skin, grapefruit and kumquat. It’s medium bodied and quite viognierish in texture, with a fresh, herbal finish and an attractive length to it. 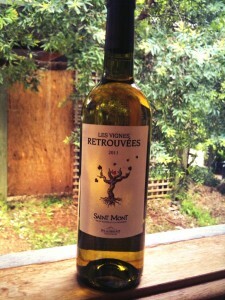 That fresh-picked mint and herb, plus the racy acid, lends this wine real vibrancy. Apparently it develops a lovely mineral character with age. Whether it gets a chance to prove it is another matter. This old-vine Verdicchio hails from the grape’s spiritual home on Italy’s Adriatic coast, a place I’m yet to visit but where I gather locals gorge on seafood washed down with this stuff. Umani Ronchi releases this wine with a bit of age, initially in concrete tanks in contact with the native yeasts, then in bottle. And what a wine it is. It’s pale lemon in colour, water white at the rim and smells of sea air, apple, pear, chamomile and sage. Almonds, brine and pear are all there on the medium-bodied palate, along with a touch of honey, beeswax and spice. It’s high in acid and finishes long with pear and brine. It’s a complex, intriguing wine that takes time to unfurl. And watching it do so over a shellfish feast would indeed be a delight. I got laughed at for calling it cute, but it is: trendy Galician Albariño in a sassy package. The name means ‘With a pair’, and white high heels adorn the eye-catching turquoise label. It’s medium lemon in colour, with a fairly pronounced nose of orange blossom, stone fruits, honey and a yeasty creaminess. It’s a little more than medium bodied, a touch oily, smoky and steely. The mid palate is rich with ripe stone fruits and citrus, finishing smoky with apricot kernel and refreshing acidity. Not a dazzling wine but fun to be had here, and not just by the chicas.